I was in Austin this week for the inaugural SxSW Eco conference. 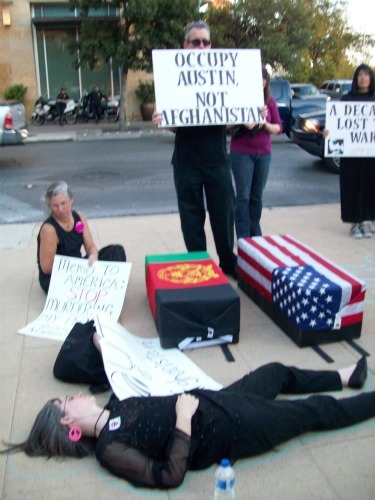 Luckily, this happened to coincide with the first official day of the Occupy Austin demonstration. So after the closing presentation, I grabbed some friends and headed down to see what the occupation looked like. As we rounded the corner from West 2nd Street, I heard the demonstration before I saw it. At the time it wasn’t the sound of chanting or angry speeches, it was something else. A joyful noise. Still, my friends and I spotted snipers monitoring the crowd from the rooftops of the banking and government buildings nearby. A silent reminder that the 1% are worried, and watching. 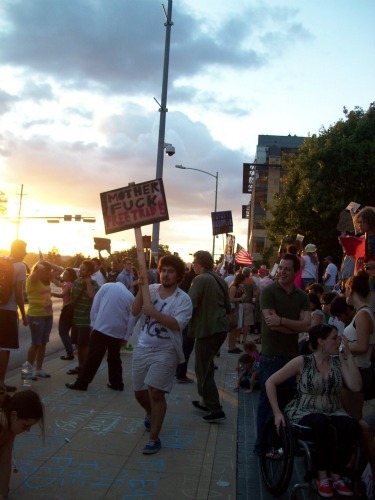 To see more of the faces, signs, and messages I found while at Occupy Austin, keep clicking. 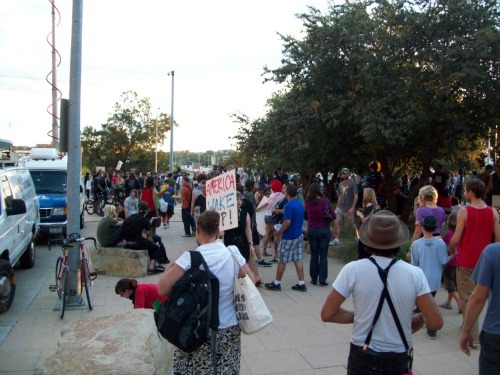 A view of the crowd as we first approached Occupy Austin. Demonstrating the corporate greed that keeps America at war and leads to the death of innocent men, women, and children around the world. 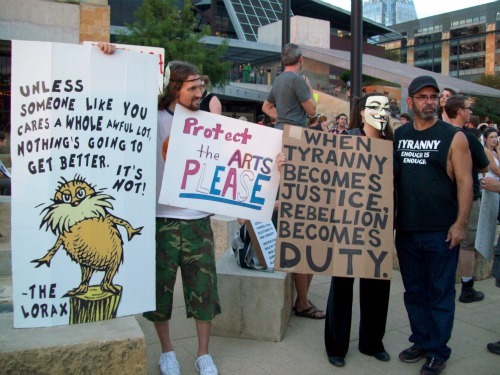 Despite mainstream media’s best efforts to typecast Occupiers as communists, welfare moochers, idiots and paid protesters, the people I saw were mothers, fathers, soldiers, students, disabled persons, teachers, artists, business people, and yes, Dr. Seuss fans. 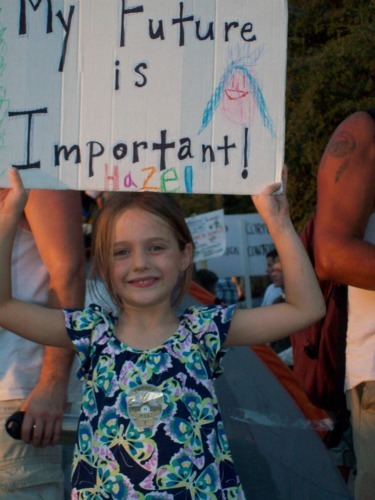 One of the greatest signs of an inclusive movement. 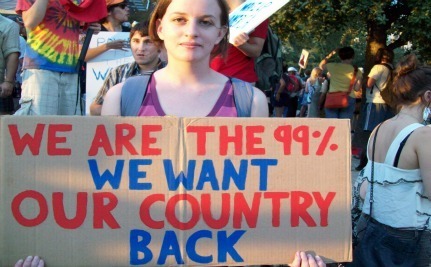 There are wealthy Americans who agree with the 99% and want to do their part to rebuild out country. 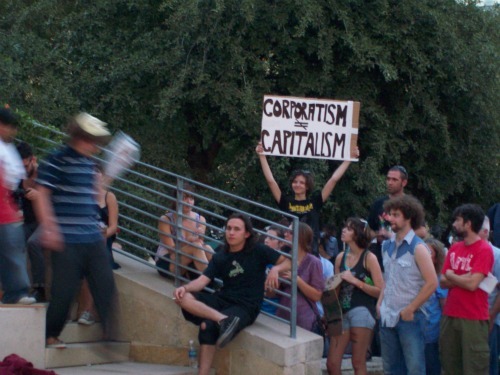 Occupy Wall Street isn’t about lynching business owners because they’re successful. It’s about taking the reins of political power away from profit-driven interests, and reinstating the people as the most important element of the political process. More power to Austin! More power to the 99%! Lindsay D. Yes, an Arab Spring or possibly an American Autumn, it is time for the people to take back their voice. After Bush and his "friends" coup in 2000, then followed by that self-inflicted wound, known as 911, but they were not yet done. Next came the "Patriot Act", followed by the "Patriot Act 2". These actions had come to neuter citizens on both sides of the isle and to empower those who seek to commit evil. Yes, we must seek to regain our voices but we should never stop there, lets us look to our brothers and sister of the Arab Spring. At the end of the day, it is through both our voices and our actions that we will realize change, we can not expect it to happen by the mere fact of just regaining our voice. 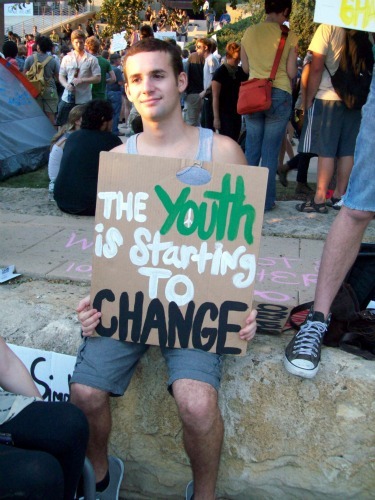 I believe the time has come to define [Occupy American Movement]. This is the voice of the 99% of Americans to stand up for jobs. We must stand up for the middle class. Wake-up the DEMOCRATIC SLEEPING GIANT!! Voice out to create jobs. We must form new unions so that we can bargain for fair wages, keep Social Security, Medicare, and Medicaid. Tax the wealthy 1% Wall Street, banks, big business, oil, jet setters. Let them pay their fair share. Not to put on the backs of the working middle class and the poor. We can not carry the tax weight alone. Stop the radical Tea Party that is undermining our country, Middle class and the poor. Show we are one! the scum bag oil companies. For you uneducated people, read this if you can! 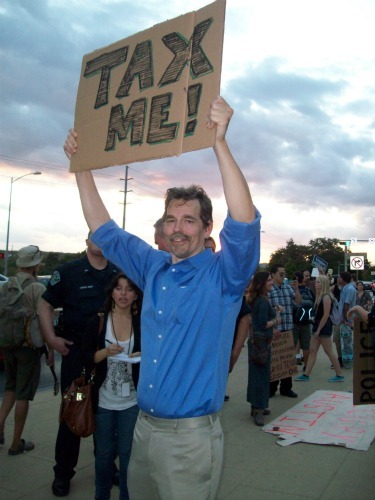 Only members of the House may introduce bills that deal with taxes or spending to create a jobs bill!. worthy. The bill is sent to the entire house for debate if the committee decides the bill is worthy of further action. If the bill passes, it is sent to the other house. A joint committee works out any differences the two houses of Congress have concerning a bill. When both houses agree on a bill, the Speaker of the House and the vice president sign it. The bill must than be signed before being sent to the president. Good idea to supply food and drinks etc. ...cash?!! I don't think so...who does that go to?! This is the voice of the 99% of Americans that are ignored by the Republican party. If you don't believe that, then you are most certainly delusional. This protest is moving across America. People are tired of the Obstructionist Republicans/Tea Party. If they were truely concerned about the deficiet, they would close the loopholes and tax breaks for the wealthy, the corporations and the oil companies. I sincerely hope that the people speaking out and those that hear them will vote these people out of office in 2012. I join the protestors in this effort to wake up complacent people who do nothing but complain! The last thing we need is a Republican president. 99% of us will have absolutely no rights at all. I am not only sticking with President Obama, but working for his re-election as well. Let's give him people who won't stonewall everything he proposes. According to Mitch McConnell, his one goal is to make President Obama a one term president.Pathetic, isn't it? Especially when our country needs are accute.